Bernard, whose name means "Noble as a bear, eludes sophistication, charm, and whimsy. He is made of Crypton Home Microbial, Green Guard Upholstery and is accident proof and requires water clean up. His eyes close to go "Night-Night", and Bernard grows with your child, becomes a Twin bed headboard when your little cub is ready! 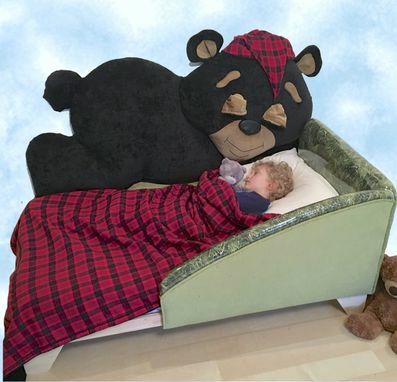 Fits a standard crib mattress, child ages 2-7. Child in bed is 6 years old. www.preciousbeds.com, youtube: Precious Beds for a virtual tour!